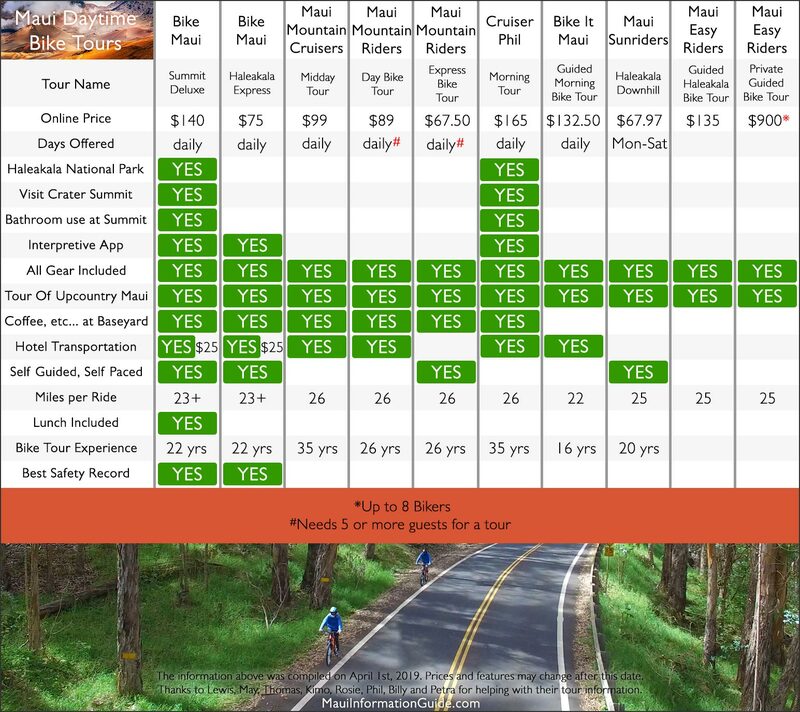 The following charts show the differences in the different tours offered for Maui biking. Offering a daily Haleakala Sunrise Bike & Zip Tour, Skyline Hawaii is one of the most trusted tour providers in all of Hawaii. Guests must be at least 12 years old to participate, and all guests must weigh between 60 and 260 pounds. This combination tour offers guests the chance to participate in several activities spanning several areas of Haleakala, and requires a desire for adventure! 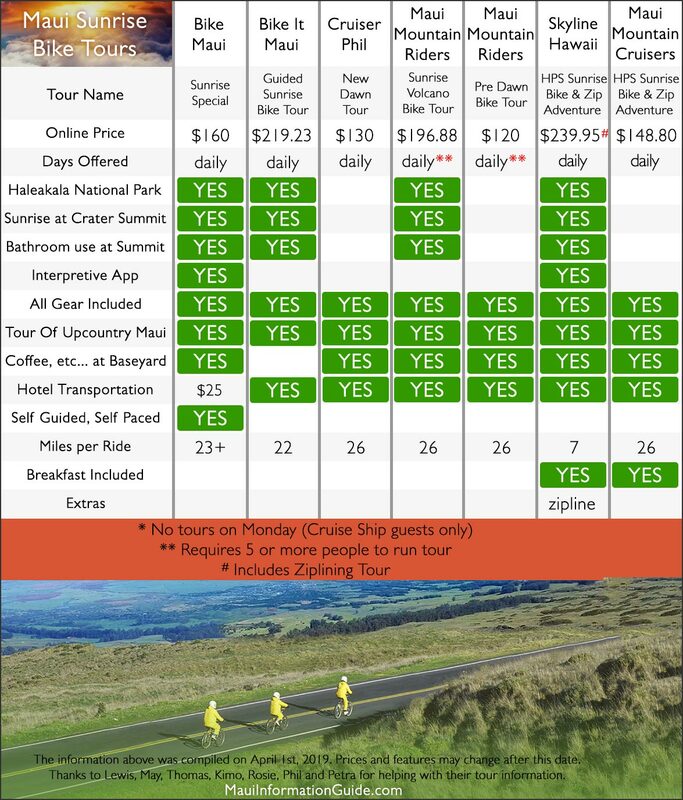 Tours last approximately 9 to 11 hours and include a special sunrise viewing at the summit of Haleakala prior to the 21 switchback bike ride, continental breakfast and 5-line zipline tour. Call 1.808.745.1323 for more information or to reserve your spot. 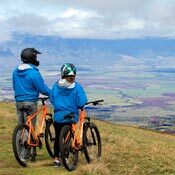 One of the most popular Haleakala gear and tour providers, Bike Maui offers travelers the opportunity to choose between three self-guided downhill bike tours, depending on their preference for timing and tour inclusions. The Sunrise Special, a top option for those who wish to start their day with a special sunrise viewing at the summit of Haleakala Volcano, begins at 3am in Haiku, while the Summit Deluxe option includes the same tour of Haleakala National Park but begins at 8am. Haleakala Express, the simplest and most budget-friendly self-guided option, skips the National Park altogether and begins at 9am, taking you straight to the starting point at 6,500 feet for your 23-mile biking send-off. Set your own pace, and meet back at the tour starting point in Haiku by 4pm. Guests must be 12 years or older, have recent biking experience, be at least 4’10”, and weigh 270 pounds or less to participate. Reserve your spot online at least 72 hours in advance for special pricing, or call 808.575.9575 for more information. For a fully guided experience, Cruiser Phil’s includes hotel and resort pick-up and drop-off services, beginning at 3am for the Sunrise Tour and 8am for the Morning Bike Tour. After traveling up the slopes of the volcano, you’ll be treated to a narrated, guided tour of Haleakala National Park before beginning your downhill biking tour with a professional local guide. Hot beverages are served, and gear like your bicycle, helmet, gloves and a wind suit are included in the tour price. During the downhill bike tour, you and your guide will make pitstops in both Kula, a highlight of Upcountry Maui, and Paia Town, a hippie surfer town on Maui’s north shore, before being returned to your accommodation later in the day. Call 808.575.9575 for more information or booking enquiries. 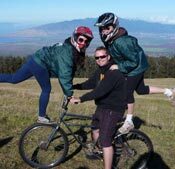 Self guided Haleakala Downhill Bike Tours are an excellent choice for those who prefer to set their own pace. After meeting in Paia Town at 7am, guests will be treated to snacks and drinks before being driven to the biking starting point at the 6,500 foot entrance of Haleakala National Park. Guests can then take the 26 mile downhill bike ride at their own pace, stopping as often as desired for photos, drinks, shopping, food, or just a little R&R. 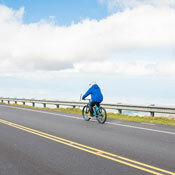 This self paced Haleakala biking option is available for guests at least 12 years of age and with a minimum height of 4’10”, but not recommended for complete beginners. Learn more and make a booking online or at 808.518.2785. 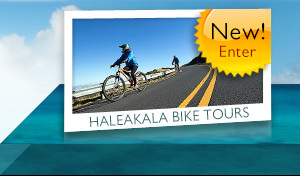 We have listed bike tours by Haleakala Bike Company (Bike Maui), Maui Downhill, Maui Mountain Cruisers, Maui Mountain Riders, , Maui Easy Riders, Skyline, Bike It Maui, Maui Sunrisers and Cruiser Phil. We hope this helps in narrowing your choice down to the perfect Maui Bike Tour for you! 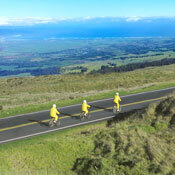 Learn more about Maui bike tours. Learn about our impressive National Park. 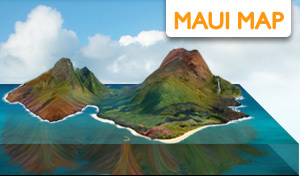 Maui Mountain biking locations and rentals.